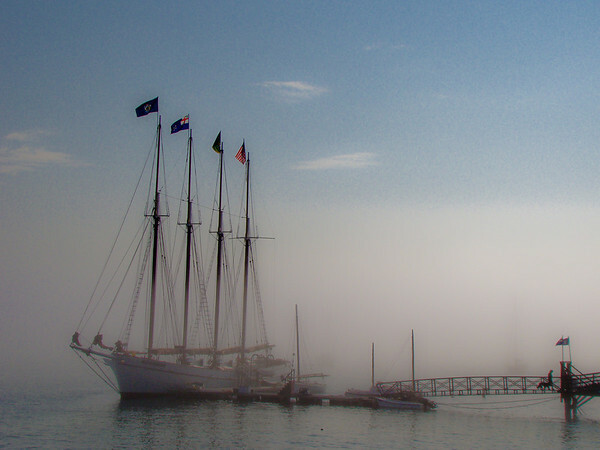 A three masted schooner set up to carry tourists around Frenchman’s Bay, the Mary Todd here emerging from the morning fog. Sony DSC H50 at about 70mm equivalent. F7.1 @ 1/2000th @ ISO 100. Programed Auto. There was a lot of morning light caught in that fog, and it took all the Recovery I had available in Lightroom to pull it back to show the visual effect of the morning. Added Clarity and Vibrance, and Landscape sharpen preset.